I haven't seen these posted before (at least a collection). They contain some interesting bits, and while I've posted some excerpts in various threads, but I've undoubtedly missed some important parts. There's quite a lot to consume, and B.2 and B.4 is where I've spent most of my attention up to this point. A. CCP Requirements Workshop home page. These are mostly a synopsis of the requirements docs (below). See also the Program Forum home page which contains some requirements-related docs. Happy digging. Let us know what you find. 1 Also attached as pdf's as all the originals are Word. edit: Add ESMD-CCTSCR-12.10 per yg1968's comment below. Thanks very much for the reminder; added to the list. As noted, not sure if it's still in effect or relevant as it's not referenced by any of the other docs. The launch of the next rotation mission can occur prior to the departure of the current increment crew working on the ISS, resulting in a handover period where two commercial spacecraft would be docked to the ISS for approximately 7-10 days. If the Commercial Partner has received NASA approval to fly non-NASA crew to the ISS, the CTS will need to provide food, water, clothing, and other logistics for these crewmembers for the docked timeframe, since NASA does not generally pre-position these supplies on the ISS. Which means typically there will be a minimum of 11 crew members present on ISS during the handover. EDIT: What's really cool is that CCT-REQ-1130-146207-DRAFT-001-001.pdf lists the pressure suit requirements near the end. "3.10.15.1 The spacecraft shall have windows excluding hatch windows for piloting tasks for crew use during all flight phases." "3.10.15.2 The windows shall provide the unobstructed fields-of-view necessary to support crew-piloting tasks during all flight phases." I assume this means windshield-type windows, similar to Gemini, Apollo and Orion/MPCV. Soyuz uses a periscope, right? I guess that won't cut it for CCP. CST-100 has this feature baselined (one "forward window"), not sure how Dreamchaser does this docking tail-first. Blue Origin, who knows? As for SpaceX Dragon, haven't seen this in any available documents or concept art, seems like a non-trival change to Dragon's mold-line. Sounds like unnecessary changes to me. Can anyone explain what's the point of this requirement? Strictly coming from astronauts who insist that they be able to pilot the craft and that the only way to pilot is to directly see out the window. Even witht he vehicles that have windows the pilots are neccesarily in front of and will be using some camera support regardless. So any idea about the additional windows for Dragon? If I look at the latest animations I see no port-facing windows, only the ones we know already. Or can SpaceX waive this requirements away? Why the heck would they exclude a hatch window? Does NASA want an affordable commercial crew program, or not? If you open the hatch in flight, you cannot longer use the window to see through ;-) Haha. Wouldn't the hatch be even easier to see through, then? So any idea about the additional windows for Dragon? Assuming that a Gemini-like window is what the requirement dictates, I see a problem. The walls aren't steep enough. Or am I wrong? The only way I see this working is if they put a bigger window on the side, tilt the pilot seat back and fly Dragon sideways somehow (i.e. waste time and therefore money, by making it operate in a completely ridiculous manner). Assuming that a Gemini-like window is what the requirement dictates, I see a problem. The walls aren't steep enough. What about a window in the NDS? Or around it? As the NDS should be smaller in diameter than the CBM, there should be space available. This requirement (if set in stone) problem is even worse for Dreamchaser, since it will "back into" it's docking. 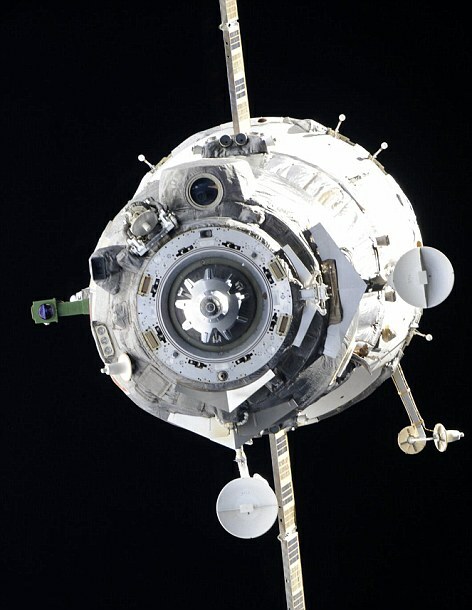 On Dragon it could be solved by adding a small window (or two) around the docking ring - there might be room for it since the IDSS(?) is smaller than CBM. This would be similar to the front observation window on Soyuz. (can be seen here: http://i.dailymail.co.uk/i/pix/2011/06/08/article-2000582-0C40949300000578-747_472x610.jpg ) But I'm not sure it is used during docking. I figure you also have to think about alignment with the pilot's head and whether it will be sufficient to provide "unobstructed fields-of-view" (whatever that means). Honestly I don't know the ergonomics surrounding this, it's up to the engineers to say if this is feasible and/or desirable. Assuming that a Gemini-like window is what the requirement dictates, I see a problem. The walls aren't steep enough. Or am I wrong? I'd guess it's possible but given the current mold like would require significant indents with consequent reduction in internal volume, and repositioning some of the crew from what's shown in that image. This sure sounds like a show stopper to me.